Can’t you just picture yourself bringing these to the table? Or maybe putting them out on a dessert bar? I promise you’ll get a few ooohs and ahs. I mean, c’mon, just look at them! There is some drama in that presentation! And ya have to love a seasonal dessert that has all the flavors we expect from fall. A rich, perfectly spiced pumpkin mousse layered with whipped cream, a bit of the intensity from the gingersnaps and just a hint of chocolate from chocolate covered almonds. That’s going to give you smooth and creamy with just the right amount of crunch to keep things interesting. These can be made the day ahead, and have to be made at least three hours ahead (so they can chill) but I’ve an included an optional step to stabilize that whipping cream so it will hold up better for longer. This is a super rich dessert & the parfaits aren’t huge so you’ll want to be careful that you don’t end up with the first few overfilled and the last skimpy. One thing that helps is putting the mousse and cream into Ziploc bags, snipping off a corner and piping, rather than spooning, into your glasses. There’s more whipped cream than pumpkin mousse, so keep that in mind. I bought everything for these at Aldi, where the pumpkin and whipping cream beat out all the sales at my local groceries. I also found the chocolate covered almonds there. You can buy your gingersnaps for this – they’ll be a little more crumbly than the Home-Made Gingersnap I used. An easy make ahead, no-bake dessert; this is very rich and the servings are smaller. Don’t let the piping scare you off; it makes it so much easier to put together. Use a Ziploc if you don’t have a piping bag. In a small microwave-safe bowl, add water and sprinkle gelatin over the top. Set aside for several minutes so the gelatin can soften. Heat in the microwave to melt the gelatin, five to 10 seconds. No need to boil. Gently stir and set aside. In a mixing bowl, whip cream, sugar, and vanilla until soft peaks form. Turn mixer to low and while the mixer is moving, carefully pour the gelatin mixture into the whipped cream. Turn mixer up and beat until stiff peaks form. Place whipped cream into a piping bag with a large tip or Ziploc bag (you’ll trim off the corner when ready to pipe) and set aside. Add cream cheese to the mixing bowl (no need to rinse bowl or beaters) and on medium speed, beat cream cheese until fluffy. Gradually beat in brown sugar until smooth. Add pumpkin, vanilla and pumpkin pie spice. Mix until smooth, scraping side of bowl as needed; fill a second piping bag or Ziploc. Set aside. 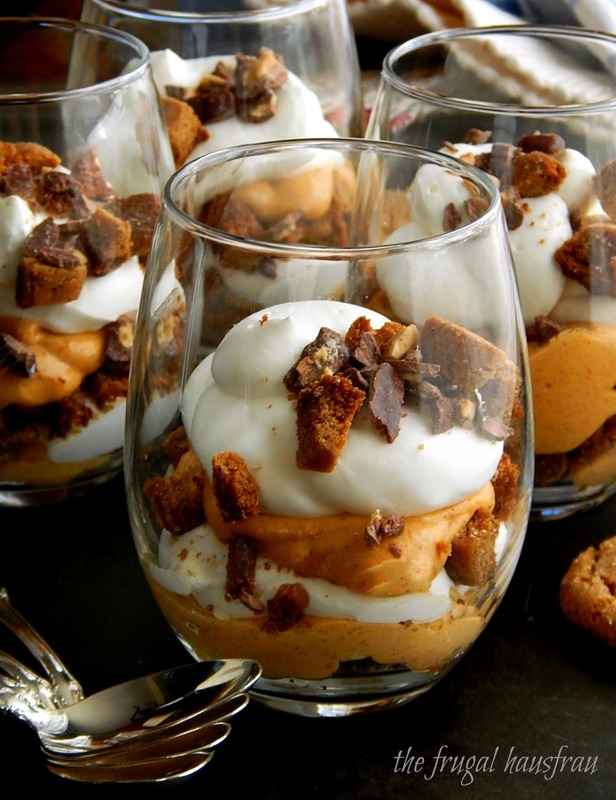 In a medium bowl, combine cookies and chopped nuts, setting a little aside for garnishing the tops of the parfaits. Divide half the remaining cookie mixture among 8 parfait glasses. Divide half of pumpkin mixture among glasses, followed by half of whipped cream. Repeat layering of cookie mixture, pumpkin and whipped cream. Use remaining cookie mixture to garnish the tops of the parfaits. Chill, then cover when cold, refrigerating at least 3 hours or up to 1 day if not stabilized; if planning on keeping for two to three days, use the stabilized whipped cream. Stabilizing the whipping cream with the gelatin/water mixture is optional but highly recommended, especially if keeping for more than 24 hours in the fridge. This entry was posted in Click here for Fabulous Food Posts and tagged Almonds, Cream, Cream Cheese, Desserts, Nuts and Seeds, Pumpkin. Bookmark the permalink. I know I like to knock out dessert ahead of time before a big dinner. 🙂 I think these felt a little more special than pie, although we had pie, too. Hi Sarah – I’ve never really made very many parfaits – not exactly sure why. I think I see more in my future! Layered dessert and make ahead – how can I go wrong serving these. Great recipe to share with Fiesta Friday this week. I love make-ahead desserts!! This sounds so good and I love the addition of gingersnap cookies. 😀 Thanks for co-hosting, Mollie! Happy FF! My pleasure, Jhuls. I think the cookies just about “made” the parfait. That and the chocolate covered almonds. Thanks Chef! Putting it those sweet little stemless wine glasses was the perfect presentation. Yes please! Looks and sounds amazing! Love the photos! Delicious piece of art!! Nice share Mollie. Wow, super-awesome job with the photography! And this is a really cool dessert idea for the holidays! These went over really well! The extra one disappeared sometime during the night! Haha, Tweety!! Kraig?? That’s my guess, anyway!! Thanks! I’ll be posting a recipe for the cookies, soon. I just couldn’t get to everything I wanted to b4 Thanksgiving – but the boxed ones would be very good, too. Your pictures are amazing and they drew me right in! These look absolutely wonderful and would be a fun change of pace. Such a beautiful dessert! Love all the tasty layers. Great idea. Hi Ronit, and thanks! Happy Thanksgiving! Oh my gosh, these are looking delicious!!! What a wonderful idea! I bet that they’re tasting awesome! Hi, and thank you! 🙂 I’ll probablybe making these every year from now on, by popular demand. Thank you, Tweety!! 🙂 I think I like these better than pie! Amazing photos!!! (And as I probably wrote already before) I love idea to use pumpkin in sweet desserts. This is not very common for me, but I did and tryed some dishes and this was oook…. 🙂 So, now I have reason for one more dessert. Thank you for inspiration! Thanks so much! Here in the US I think pumpkin is mostly used in desserts – and it’s really only been recently that people (generally) have started warming up to the idea of using pumpkin as a savory ingredient. But you really couldn’t go wrong with trying this dessert!